Pets are our best companions. They give us more love than humans ever will. However, these adorable furry friends are pretty tough to clean and take care of sometimes. I’ve always had a house full of pets since I was born. At some point we had 2 German Shepherds and a Samoyed Dog that were losing hair continuously but I have NEVER found my house dirty nor stinky. When eventually I got my own place and my own pet I realized that what looked so easy before was actually a pretty hard, hair was everywhere no matter I much I kept vacuuming. I decided to call my mom and ask her what was her trick and I found out that it’s all about having the right products. Before I walk out the door and say bye to my terrier mix Peanut, I’ll notice a lot of his hair all over my shirt. Not the best look if you’re trying to be professional at work. Sometimes I’ll resort to tape to take off his fur if I’m desperate, or a lint roller. But I really hadn’t looked too much into pet hair removers until I found this one. The best part about this one is that there are no sticky sheets. Instead, when I’m done brushing I just put it back in its charging base and the base cleans off the hair. 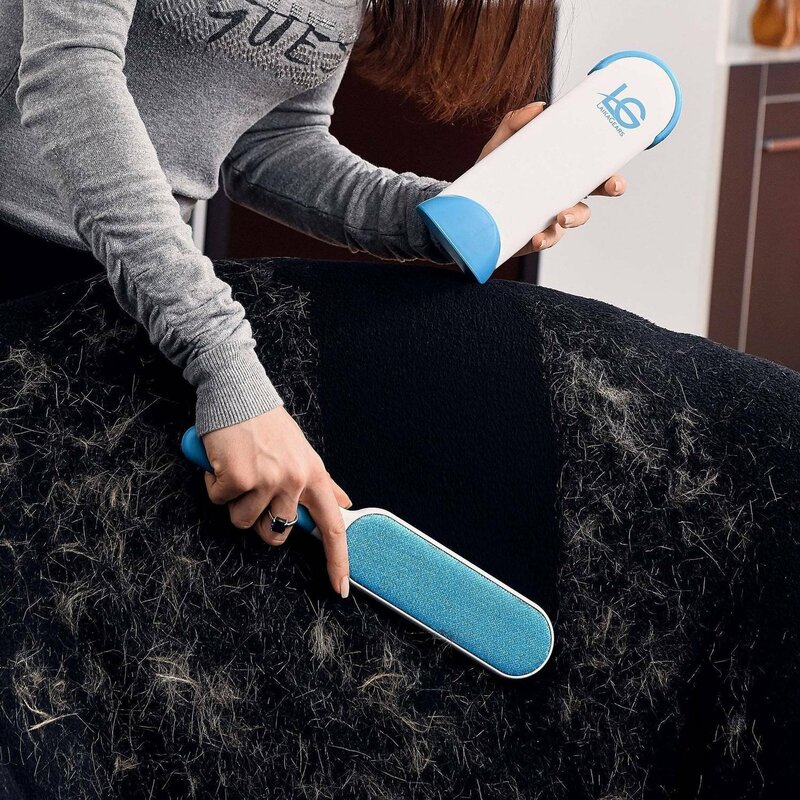 That’s right: pet hair remover cleans itself! Such a time saver. As much as I love my dog, I hate his hair getting all over the couch. What pet owner does? This hair dryer was a massive discovery for me, it makes it so I don’t have to spend a long time brushing him. This dryer is super powerful and blows his excess hair right off. As someone who isn’t used to devices like this though, this thing is pretty loud. I have both carpet and linoleum in the house, and Peanut gets hair everywhere, even with short hair. Thank goodness he doesn’t have a lot of fur! For the hair he does have, I use this broom to get the hair off all my floors. When there are wet messes, there’s a squeegee attachment. 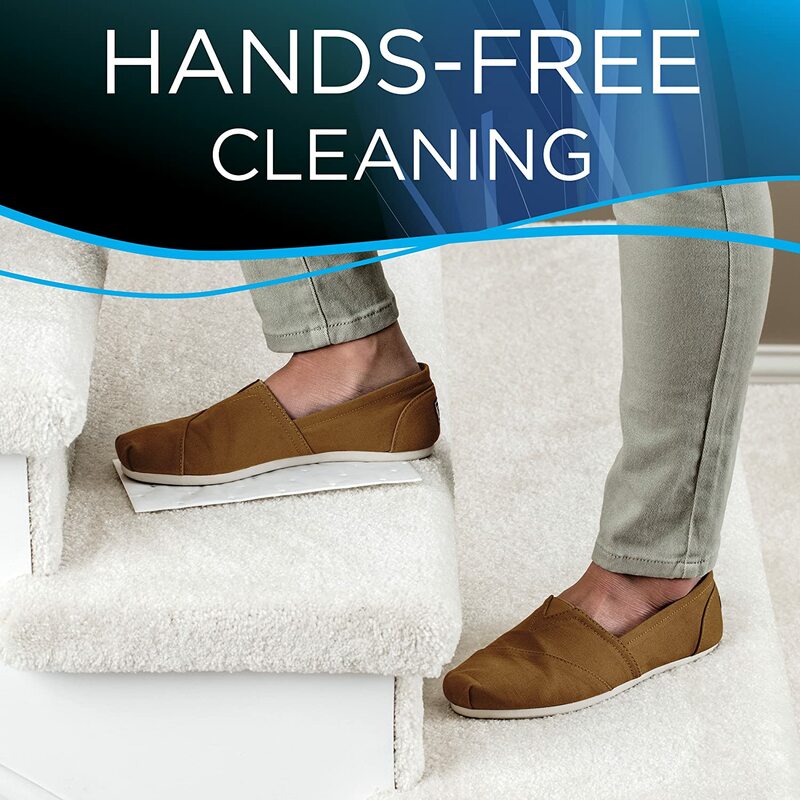 It also works wonder with dust and dirt on the floor. No, you read that correctly — that Waterpik. Who knew they made pet products too? This one attached to my hose outside, but can also be used indoors with a shower head. 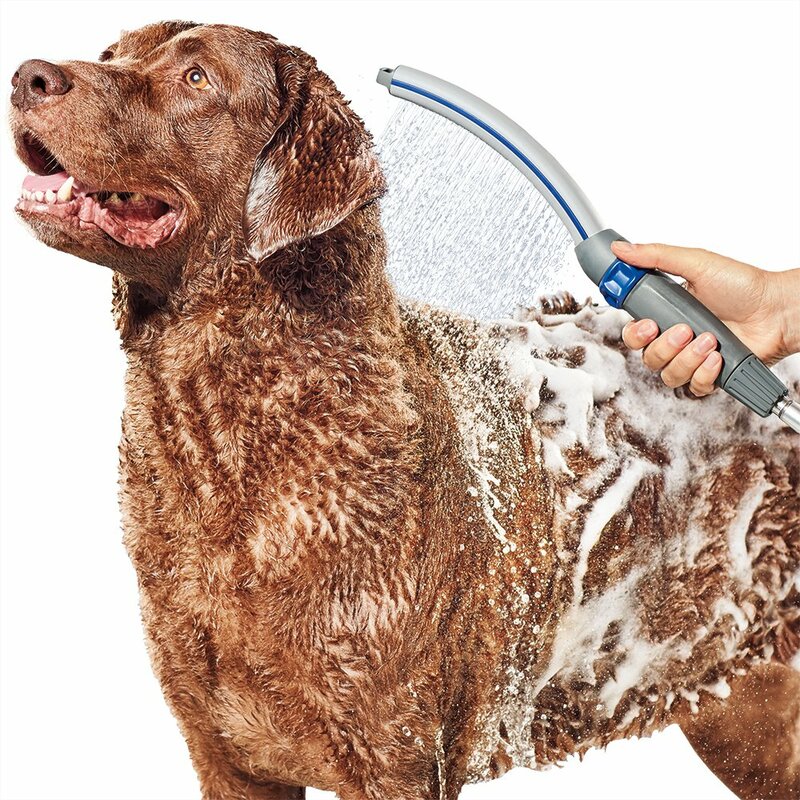 My dog is medium-sized, so the adjustable settings — wide spray and narrow spray — made it very convenient. Wide for his body, narrow for his legs. I could also increase or decrease the strength of the water flow. This was way easier than spraying him down with a hose or using my shower head. 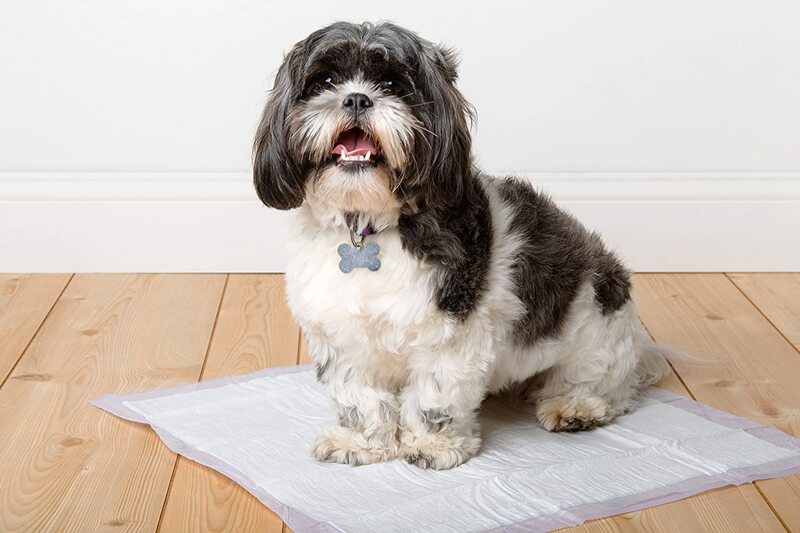 We, pet owners are all more than familiars with stains on the carpet and the pain of having to get rid of the spots and the smell. In my latest shopping round I decided to try this Stain and Odor Remover and wow, did it work! No stain or smell. This stuff is almost industrial strength without any of the harmful chemicals. I’ve trained my dog well in the “business” business. But some of his smaller playmates still need a bit of training. That’s where pads come in handy. Gel pads like these ones get rid of the scent and keep all of the business in one place. Peanut knows he can only do his business outside. But sometimes he’ll have his moments where he’ll be sick and just can’t hold it in. Sure, there are pads, but I can’t cover my whole floor in them, can I? Luckily I can use Stomp ‘N Go pads to clean up when he does go on the carpet. All I have to do is put the pad on his business, stomp on the pad, let it sit, and then take it out after half an hour. Cuddling with our pets is one of the best feelings in the world, but a lot of times it comes with a strong scent or some stains that you’ll carry around and they’s hard to get rid of, especially from the sheets! I always wished there was something pet-specific out there that could take out the stains, because sometimes human detergent didn’t cut it. Luckily, Nature’s Miracle can clean through any pet stain, from my shirts to my pillowcases. He’s a messy dog sometimes, so I’m glad there’s something out there than can keep up with Peanut! How do you take care of your pet? Leave a comment below!